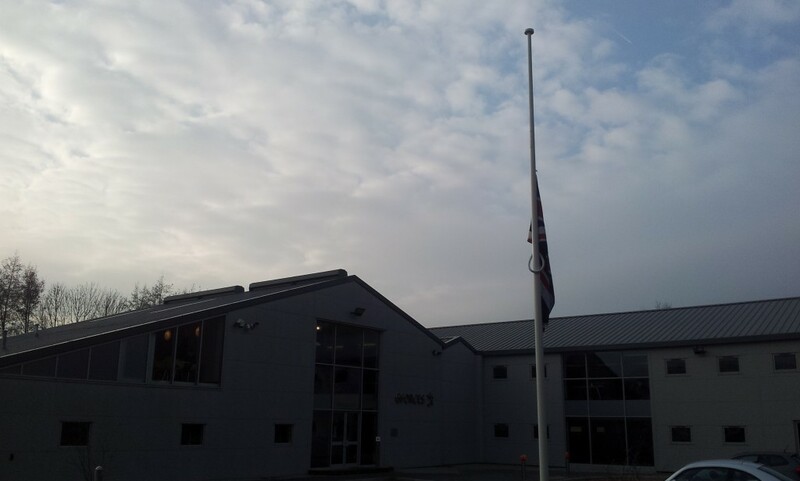 Today GForces is currently flying its flag at half mast and will for the rest of the week as a mark of respect to Flight Lieutenant James Corbin, who has sadly passed away. The GForces site was named after ‘Jimmy’, in recognition of his heroic efforts as a fighter pilot in the skies above during World War II. Jimmy was always a guest of honour at GForces and we were delighted that he was able to officially open the new GForces facility, together with two of his former RAF comrades, in 2007. Born and bred in Maidstone, Jimmy was an airman through-and-through, learning to fly after joining the RAF Volunteer Reserve in 1938, at Rochester Airport. With just 20 hours of flight time in his log-book he was called into action as war broke out, graduating into Spitfires after stints at several flying schools. He was one of ‘the few’ who flew in combat throughout the Battle of Britain, first with 66 Squadron at Coltishall then briefly with 610 Squadron based near Newcastle, before returning to 66 Squadron and his native Kent. He saw considerable action in the skies above his home county, citing the fact that he didn’t want to see the enemy over-run his home town – which he could see from his cockpit as he flew in action – as a major driving force. In one particular dogfight, he recalled being ‘jumped’ by around 30 German fighters yet managing to elude their guns. While undertaking offensive missions strafing German airfields in France he was hit by flack, but managed to nurse his damaged Spitfire back to England to resume combat missions. In the latter stages of the conflict, he was posted to Gibraltar and supported Operation Torch in Algiers after a year-long spell as a gunnery instructor. After the war, Jimmy returned to teaching engineering – his career before war broke out – and settled in Bearsted with his wife and three children. Although we greatly regret Jimmy’s passing, it reminds us of those who fought – and continue to fight – on our behalf. At GForces we have always been extremely proud of working in a building that bears his name. The news of Flight Lieutenant Corbin’s death simply enhances this sense of pride. Rip Jimmy.A modest hero who was once my teacher in the 1950’s. We met again five years ago and our discussion was about our days at Colyer Road school, Northfleet. I consider it an honour to have been caned by him once! A great memorial G force. Visited your offices four years ago from Lancs. Thank you for your comment John. Funnily enough a couple of colleagues here mentioned Jimmy taught their dads when he was teaching technical drawing at Maidstone Technical High School for Boys. I haven’t been told of any caning stories but he did flick a student on the head with a ruler. Very sad to hear of the passing of Flt Lt Jim Corbin D.F.C. I had the pleasure to meet him in September at the GForces office whilst on a visit from Chester. We really do all owe an emmense amount to people like Jim and I’m glad that GForces chose him to open your building which I’m sure that was another very proud day for him. Long live his memory. NC. I was taught technical drawing by him at what was the Maidstone Boys’ Technical School and for some odd reason his nickname was always “Bomber” Corbin, which, of course, was somewhat erroneous, being an ex-fighter pilot, which we never knew. I have to say that his temper was never the the best, having seen him throw classroom objects at sleepy or inattentive pupils but maybe that’s what spurred his flying exploits on! Modest man about his bravery, it would seem. “Bomber” taught me Technical Drawing at Maidstone Tech. 1960-1966. Always my favourite subject and it inspired me to a subsequent degree and career in engineering. I’m indebted to you for that Jim – Oh, and also for winning the war! Rest In Peace. Rest in Peace Mr Corbin, sir. Simply the best teacher I ever had, and one of the finest people I ever knew. I don’t remember any violent actions from him. But then I wouldn’t have have been on the wrong side of him. Living in cornwall I’ve only just found out about Mr.Corbin’s passing. Mr.Corbin (we would NEVER have called him Jimmy) taught me technical drawing at Maidstone Tech in the 1970s and I think I only managed to get a grade A at ‘A’ level because I was too terrified of him to get anything less! Of course I mean that very affectionately….he was a tough teacher who didn’t suffer fools (such as us teenage boys) gladly, but boy did we learn from him. Armed with the thorough grounding he gave me in drawing over those years I subsequently went into a career in architecture. Although he was nicknamed “Bomber”, as ‘Dave’ points out above, this was erroneous. I knew then that he was a fighter pilot and once, in 1973 or 4, I plucked up the courage to ask him to sit for a taped interview with me for a history project…which to my surprise and delight he agreed to do. So, laden with my new cassette recorder, we spent a whole lunch hour in his office at the back of the classroom where he answered all my inane questions with a degree of patience I hadn’t previously realised he’d possessed; you can imagine my abject horror when, at the end of the interview, I went to turn off my cassette recorder only to find that I hadn’t switched it on at the mains! I was trembling as I told him the bad news, rating my chances at leaving that room alive no better no 50/50, and I imagined I could see the steam starting to blow out of his ears, but to his lasting credit he took it quite calmly and even agreed to try it again the next day…when, I’m glad to say, it went very well. I must have that old cassette tape somewhere up in the attic so I’ll try and find it. A great man, a true inspiration, and I consider it a real privilege to have known him. God bless you Mr.C. As many previous comments ‘Bomber’ Corbin taught me technical drawing at Maidstone tech from 1971 to 1976. He was an exceptional teacher who predicted the O level questions which enabled a grade A. Thank you Mr Corbin. My lasting memory was seeing pieces of chalk smash into the black board at the rear of the classroom ! Only lately did we discover his part in saving our country. Respect. Like many others commenting I too was taught Technical drawing by Mr Corbin and remember with deep respect his passion and wit when in the classroom – it is with great sadness I hear of his passing as I too knew nothing of his career in the RAF …Blue Skies old chap, Blue Skies for a hero. That’s right – that he didn’t want to see the enemy over-run his home town – which he could see from his cockpit as he flew in action – as a major driving force.